Timing Is Everything – In Magic – Comedy – Life! Timing is Everything is a DVD by Tony Clark. If you already have it you know what excellence means. When a novice tells me they saw something on youtube and they want it, I’ll often say they are not capable at this point in their career of doing something like that. They often don’t care. They want it. Then they come back and tell me its so much trouble or something doesn’t work right. I tell them if they really want to be a magician, there are 2 DVD’s they should watch if they want to know what lengths a magician will go to if he wants to do an effect. Timing is Everything is one, and Paul Getner’s Silver and Steel Volume 2, (Ring on Hourglass effect) is the other. I tell them up front they will never do Ring on Hourglass, but its something I believe every magician should see, so they’ll know how much thought goes into a miracle! But that isn’t why I wrote this post. I digressed. As magicians, mentalists, comedians, clowns, you know all that. What you don’t know is this. I went to my granddaughter’s last soccer game of the season. She is all of 4 years old. Some of the girls on her team are unbelievable. They get it. They go after the ball, hang on to it when they can, pass it when they have to, kick it and score. Unbelievable to see a tiny blond 4 year old do that. My granddaughter runs with the pack. If the ball ends up in front of her she’ll kick it. She knows what has to be done, but doesn’t have the drive yet. But there’s one little girl, when her name is called, she runs out onto the field and when the ball is kicked and everyone goes after it, she sits down and pulls out the blades of grass or finds some sand to play with on the field. Well in this last game, (they play in teams of 5, no goalie’s at this age) our team is at the other’s net, trying to kick the ball in but the other team is stopping them when someone from the other team got a hold of the ball and made a breakaway and headed towards our net. She’s running down the field with both teams chasing after her with the exception of the little girl who is sitting on the grass with her back to them playing in the sand not far from our net and the parents are cheering and yelling but this little girl is oblivious to the whole thing. At one point she decides to stand up and does so slowly, still with her back to the hoard running down the field. Just as the girl with the ball is about to run past her, the sand player steps to the side, right in front of the girl with the ball who bumps into her and stumbles, giving our team the chance it needed to reclaim the ball. The coach told her what a great job she did and everyone cheered and called out her name and guess what! She started to run down the field with her team. She was the hero. So it doesn’t matter if its carefully planned or just by chance… timing is everything. What does the name J.B. Bobo mean to you? One of our customers recently ordered a DVD, Bobo Volume 23 of the Greater Magic Video Library. Our usual suppliers didn’t carry it, so I did some research and found out who had it, and I ordered a few. I always associated the name Bobo with the Bible of coin magic, Modern Coin Magic, so I though he was a coin man. When I got the DVD’s and saw a photo on the cover with Bobo and his wife doing a kid show I figured I must have ordered the wrong volume. But no, when I read the contents, there was indeed coin magic included; Bobo on Coin Vanishes, Tenkaki Pennies etc. I was glad that I didn’t order the wrong DVD. So I read a little about his history. Many who are familiar with him and his work may know that he was born and worked in Texarkana. He was also a kid show magician. Did you know that he did over 13,000 shows, during his 50 years of performing. 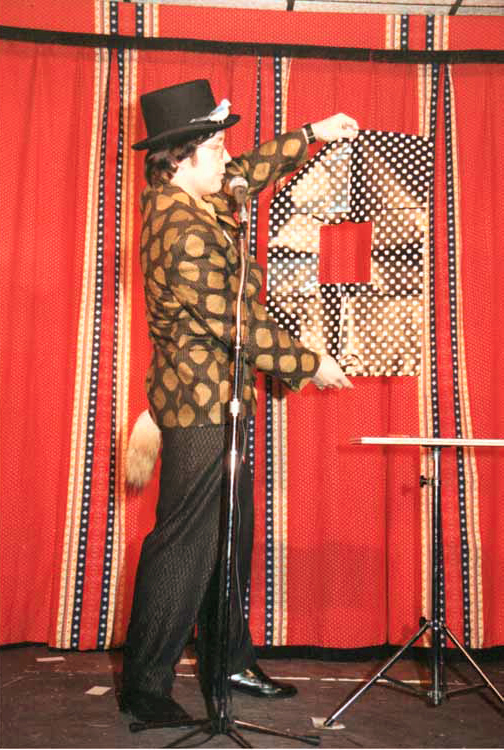 At one time he was doing 500 school shows a year, later it went down to only 300 shows. The part I found interesting is that as a young child he and his family moved to Ontario, Canada where the family moved around a little. They lived in Chesley, Hanover, Hamilton and Windsor until he was 19 at which point they returned to Texarkana. What I found more interesting was that he was christened J .B. Bobo as his great-grandfather was a french immigrant whose real name was Jean Beaubeaux and the name was anglicized to Bobo. In any case, it looks like a great DVD. In the first part he does an interview on how to be a successful school show performer, how to get bookings, what to charge, etc. I guess if anyone knew, it was him. The second part is actually a taped show, where you can see dozens of proven “bits and tricks”. The third part is on coins, which is what my customer bought it for. Two posts ago I wrote about Magic Dealers at Magie Montreal 1988-89 and I received such a touching comment from one of our Convention Goers that I thought I would share it with you. It was from no one else but The Great Unknown. He was certainly known to anyone who attended Magie Montreal. This is what he said and it is a great compliment to us. Thank you Daniel for bringing so much laughter to Magie Montreal. Boy ob oy did I have fun at the Magie Montreal conventions (as a matter of fact I never attended any other convention)! 99% of the magic equipment I ever owned came from Perfect Magic. The Magie Mtl conventions gave me a real incentive to perfect my art of being ridiculous. 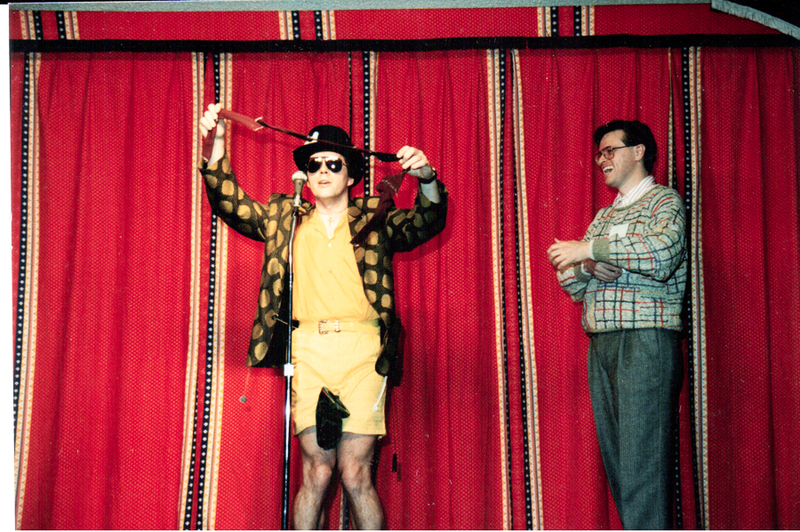 When Magie Montreal conventions became something of the past so did my short lived career. Just now I come to realize that I never told Phil & or Evy that THEY were responsible for my ten-year amateur (or, at best, semi-pro) career. 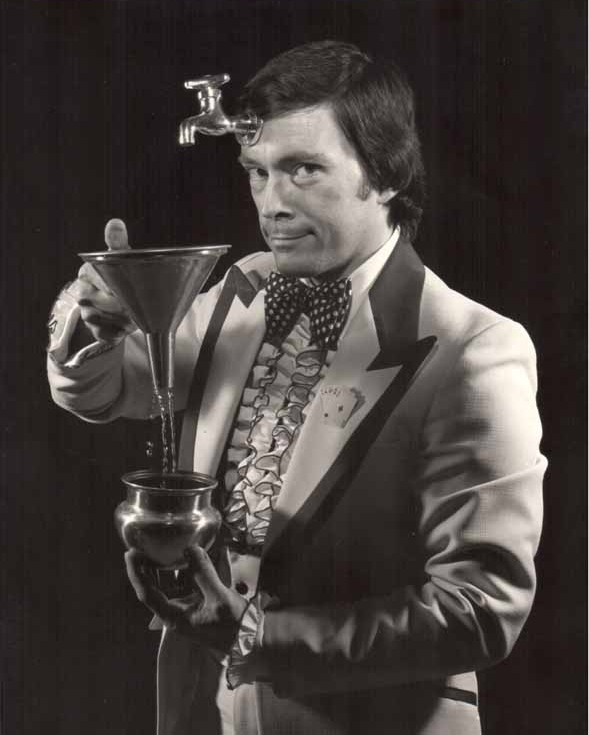 To start with I got interested in magic by attending magic shows on Saturdays at the magic shop. Then I heard of the magic conventions and I got carried away. A million thanks to Phil & Evy for starting my fire and then nurishing it. Knowing you was a real treat. I only have sweet memories of this too far away past. Great job Phil & Evy. My very best regards to you. Daniel with Blair Marshall encouraging the act. Many of our customers are finger flicking card magicians, and many are professional show people doing only magic for a living…believe it or not… but there are also many who are natural entertainers and don’t want to kill themselves or spend too much time on learning the real deal. The phrase “evidence of a misspent youth” comes to mind as I write this. They want self working magic, not to be confused with beginner magic. Beginner magic, in my mind, is for someone who is interested in learning how to do magic and needs a place to start, and he may have been inspired by one of those finger flickers and was impressed. He starts on that road, with simple stuff and progresses. Mark Wilson’s Complete Course in Magic is wonderful for someone beginning in magic from age 12 and up. But some people don’t want to read. Furthermore they don’t want to practice. But they do want to do magic. I’m not knocking this. Some people have excellent reasons for this. People giving speeches, or presenters for instance, may want to do something to wake the audience up. Do something dramatic at the beginning and they’ll pay attention to see what’s coming next. I , for one, once was called upon to do an after dinner speech for Hydro Ontario. When I got up on stage I put my hand around the metal microphone stand and using a funkin’ ring sparks went flying. I asked if there happened to be an electrician in the room and it nearly brought the house down. It was clear sailing after that. It wasn’t real magic but it did the trick, so to speak. A chemist who was promoting a fertilizer at a conference came in one day to see what I had for him. The Growing Glove was perfect for him, when he explained to his audience that he got some fertilizer on the glove. And then there was the guy who needed something small for a conference and his jaw dropped when I did the Bill Tube for him but said he didn’t want it. I couldn’t understand why. He said he was not a magician and he could never do anything like that. I showed him how it was done, which is something I normally don’t do, but I knew he could do it. As soon as he saw it he said “sold”. Then he chuckled and said, “It’s a conference for engineer’s and not one them will figure this out!” He was thrilled. Of course I told him he would still have to practice. There’s always “patter” and timing that must be considered to get the most out of it, as every good magician knows. Why am I writing about this? I have customers who ask for my advice on what is easy. There are so many tricks out there. I looked up our categories and we don’t have a self-working category. Hmmm. In case Phil thinks he is way behind in his work now, wait till I inform him that he has to create and list another category. In the meantime if you want a self-working trick just write “self-working magic” in our google search (located under our search box which will not do the trick) and you’ll get pages of self- working tricks or anything else you happen to be interested in. A customer just came in and wanted ACAAN. He’s been through our site many times but never used the google search. It’s thanks to my son Mike that I even know about it and I had it installed immediately. It saves me so much time and frustration. I hope you use it too. I showed our customer what happens when I put the topic in the google search and clicked on the magnifying glass on the right of it. He thanked me profusely. So if you’re looking for Self Working Magic or anything else, just put it in our google search et voila! We first met Guy Camirand in the late 70’s. It may have been at our magic evenings which we held on Thursday nights when we were living on Harland Road in Hampstead. This was before we had a shop and before the launching of the Camirand Academy of Magic, publisher of Magic Books, producer of Magic DVD’s, and fine quality effects. Besides being a top notch magician, magic dealer and supplier, he is also a professor of magic who gives courses at Perfect Magic and has done so for many years. May he continue to do so for many years to come. He was serious about magic when we met him and was interested in starting a magic business even then. It was and still is his passion. 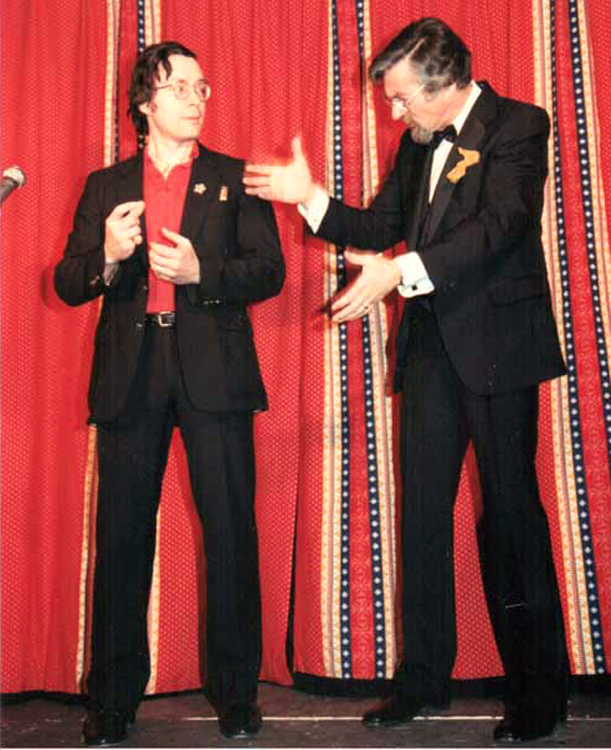 We also first met Hans Zahn of Videonics, a magician and a pioneer in VHS Magic Teaching Tapes, which included many of the most famous people in magic, including Dai Vernon (who went to Newfoundland for the filming in 1982) and Phil Matlin (How else could I form a sentence containing both Dai Vernon and Phil Matlin) in the late 70’s, just to name 2 out of many. Hans lived and still lives in Newfoundland. Phil and I became good friends with both Guy and Hans. So this morning, August 1, 2012 while I was in the magic shop busy answering emails, you can imagine the shock I had when Hans from Newfoundland phoned to tell me Guy was in the hospital here in Quebec waiting for a triple by-pass. I called Guy immediately. He did not have a massive heart attack, TG. He went to a walk-in clinic with a sore throat and when the doctor said he would treat that, Guy said that while he was there, he might as well tell him of another ailment he was having. The doctor said no. We can only treat one thing at a time. Okay, said Guy. I’ll tell you what the other thing is and you tell me what we should treat. Fine. He told him every so often when he’s walking he gets pains near his chest, but nothing terrible, etc. I don’t remember exactly the symptoms that Guy gave him but the doctor said he would check out his chest rather than his throat. After checking him out, he gave him a slip of paper and told him to go straight to emergency and he wouldn’t have to worry about waiting. He was admitted immediately and is now being treated for his sore throat which has to be better before they operate. He’s in good spirits and is being well taken care of. So to me its lucky that he had a sore throat, because he’s been having those pains for awhile, but were not strong enough for him to worry about. Strange how magicians can never come straight to the point but go around to get where they are going. I’m sure you all join us in wishing that all goes well for Guy and that he has a speedy recovery.